There are a few (actually, lots of) actors that tried venturing out into the music world. Some (very few) made it work and others ... Well, here's a list of 15 that should've stuck to their day jobs. Lindsay Lohan The "Mean Girls" star debuted her first album "Speak" in 2004 and it actually did pretty well commercially. Her music video for "Rumors" even got nominated for an MTV Video Music Award. She wasn't horrible, but she just wasn't pop star good. 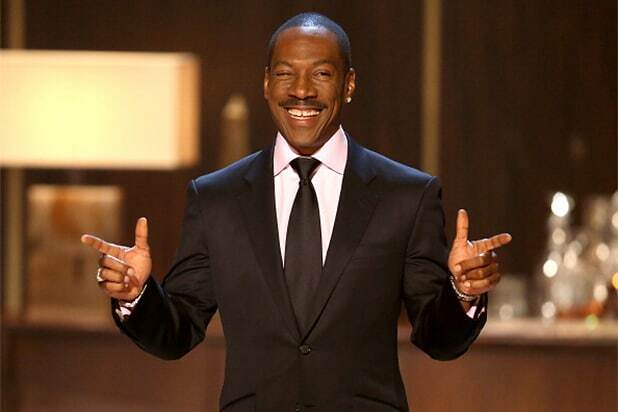 Eddie Murphy Believe it or not, Eddie Murphy had a low-key music career. You probably know him best from his single "I'm a Believer" off "Shrek" ... and that's probably it. He released a reggae single with Snoop Dogg in 2o13, but like most of his stuff, no one's heard it. Johnny Depp Johnny Depp has been into music for a very long time, but it wasn't until 2015 where he took it upon himself to create a band with Alice Cooper and Joe Perry called Hollywood Vampires. He's told People: "Music is still part of my life ... But you won't be hearing The Johnny Depp Band. Thawon't ever exist." Thank God. William Shatner William Shatner's music isn't exactly music more so as it is interpretive spoken word. He speaks the lyrics in an exaggerated manner rather than sing them so there's that career down the drain. Ryan Gosling We love Ryan Gosling, but his music career? Not so much. The actor started a rock group called Dead Man's Bones with his friend Zach Shields in 2007. They released an album by the same name too. Their music couldn't have been all too bad because a song made into the soundtrack for "The Conjuring." As much as we all love "La La Land," we think the musical numbers prove that he's a far better piano player than he is a singer. Leonard Nimoy Leonard Nimoy decided to enhance his "Star Trek" character by recording science-fiction themed songs. His first album was titled "Leonard Nimoy Presents Mr. Spock's Music from Outer Space." Nimoy's music was eclectic, to say the least. Michael Cera Michael Cera is a touring bass player for the indie rock band Mister Heavenly. In 2014, he released his debut album, titled "True That," to generally positive reviews. He hasn't released anything else and quite frankly, we're glad he hasn't. Movies seem to be more of Cera's thing. Kevin Costner This big-time movie star is also part of a country rock band called Kevin Costner & Modern West. They even started a worldwide tour in 2007. Apparently, he's at his happiest when making music, but I think we can all agree that we're happiest when he's acting. Keanu Reeves The "Matrix" actor played bass guitar for a rock band called Dogstar and also performed with another band called Becky. Turns out music was just a hobby for the actor, because he quit when the band got too serious. Jennifer Love Hewitt Jennifer Love Hewitt actually started her music career pretty early. At age 12, she debuted her first album exclusively in Japan and it did extremely well. Shia LaBeouf Shia LaBeouf recently made headlines when he showed everyone he could rap, but there were a few people who weren't too pleased with his freestyle skills -- Soulja Boy. Although LaBeouf wasn't a terrible rapper, he probably should just stick to acting -- or just trying to stay out of trouble. Bruce Willis Bruce Willis' debut album was actually released by Motown in 1987 for its R&B stylings. "The Return of Bruno" didn't do very well but it also wasn't completely garbage, it was just OK.
Jada Pinkett Smith Unlike her husband, Will Smith, Jada's music career didn't land her a Grammy but that doesn't mean it was all bad. She created a metal band called Wicked Wisdom in 2002 and when Sharon Osbourne saw them perform she said she was "blown away." Russell Crowe Russell Crowe's musical career also started way back when (1980s) and has been going subjectively strong until at least 2012. It's obvious his acting career was a lot more popular than his singing. David Hasselhoff David Hasselhoff had a pretty extensive music career, which kicked off in the 1980s. He even made it to the No. 1 spot on German pop charts with this single "Looking for Freedom." He dropped his 17th album in 2012, so either he has a pretty good fan base (at least overseas) or he just doesn't care and makes music just to make it. Either way, his time is better spent on screen.